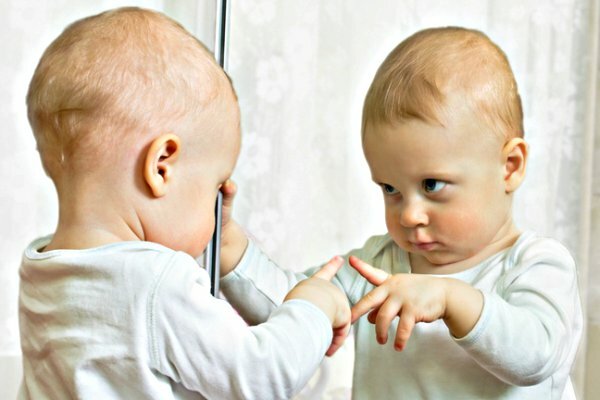 Babies and Mirrors - Mom This! : Mom This! From the moment they emerge from the womb there is one thing that babies just seem to be fascinated by and that pretty much never changes. It isn’t a toy or even a color or shape. The one thing all babies gravitate towards as their eyes begin to focus is the human face. We are wired to look for it as a place of safety and recognition from the moment we are born. Little babies don’t even really care whose face it is, although the faces of those around us that we recognize seem to light up their smiles pretty easily. It is this need to connect with a human face that makes babies and mirrors such an important part of a baby’s development. With mirrors we help our newest member of the family track images as well as focus and understand various facial expressions. So grab a mirror and try a few of these mirror games with your little one. Start by leaning a mirror against the wall, at floor height. Now sit across from it, not too far as baby’s eyes are still learning how to focus. With your legs crossed, set your baby on the floor, leaning against your tummy and facing the mirror. If you want to involve your older kids in this you can have them hold a hand mirror while you do this instead. Smile. You can also introduce your baby to the various parts of her body using the mirror. While she is sitting with you facing a mirror, touch her nose and various parts of her body, each time naming them. Right now she may not understand what you are saying, but she does see the movement in the mirror as you touch her nose and toes. Baby will love this new game and maybe even look forward to it the next time you sit down in front of the mirror. Babies and mirrors, new best friends! Getting your baby to work at sitting up during tummy time can be a challenge. But when you place an unbreakable mirror in her crib for her tummy exercises you will be delighted how she will work hard at sitting up for her new friend. Adding another mirror above her will also keep her content when she is lying on her back, smiling at her special companion in the mirror. Believe it or not, using a mirror helps a baby to develop social skills in addition to the motor skills we mentioned above. At first the mysterious friend is simply someone who seems to be agreeable to whatever she is doing. Soon she will discover that this stranger is her, and with it the sense of self will strengthen. Babies are always intrigued with the mirror, as this video attests. And, of course, we are always delighted with babies and mirrors as well, as the scene of a little one discovering their reflection continues to bring joy to parents everywhere.